DRINK NOW OR LAY DOWN? «"It was my first-ever opportunity to taste a 1929 Châteauneuf-du-Pape," said Robert Parker (Wine Advocate), who still hadn't recovered. "It might not have had all the qualities of its youth, but it had a soul. And I'll never forget it!" Châteauneuf du Pape is a wine that benefits from laying down. How long it should be aged for depends on the vintage and on personal preference. 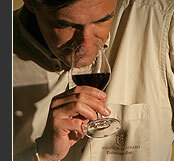 We produce very rounded wines that can be drunk young with just as much enjoyment.